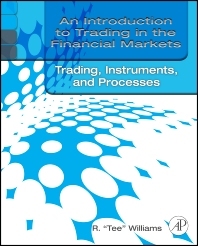 Trading on the financial markets requires the mastery of many subjects, from strategies and the instruments being traded to market structures and the mechanisms that drive executions. This second of four volumes explores them all. After brief explanations of the activities associated with buying and selling, the book covers principals, agents, and the market venues in which they interact. Next come the instruments that they buy and sell: how are they categorized and how do they act? Concluding the volume is a discussion about major processes and the ways that they vary by market and instrument. Contributing to these explanations are visual cues that guide readers through the material. Making profitable trades might not be easy, but with the help of this book they are possible. Explains the basics of investing and trading, markets, instruments, and processes. New entrants into financial technology and financial markets positions, junior level financial technology and financial markets professionals looking to advance their careers. R. "Tee" Williams is an expert on market data operations and strategy. R. "Tee" Williams is a well-known consultant and Principal of Tee Williams Associates. Tee has built industry recognition as an expert on market data operations and strategy.